Join our rewards program today!! 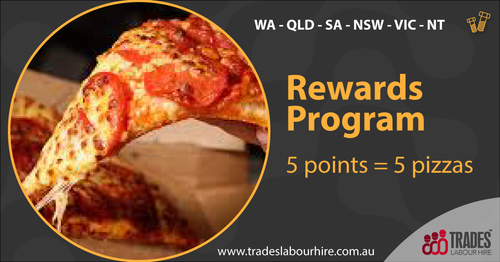 Every new staff member your company orders, you receive 1 point and everytime you get 5 points, we deliver 5 Domino's Pizza to your home or work. Thanks for your ongoing business! Each worker needs to be hired for a minimum of 2 days, please contact one of our recruitment consultants with the delivery address 2 hours prior to delivery. Thanks for choosing FT Workforce!